In case you hadn’t heard, the licensing for Windows Server & System Center are moving from a per-processor license to a per-core license. Customers with processor licenses with Software Assurance (SA) can upgrade to Windows Server 2016 at no additional cost. At end of the SA term, processor licenses will be exchanged for core licenses and customers can renew their SA on core licenses. Windows Server Datacenter and Standard Edition 2proc licenses with SA will be exchanged for a minimum of 8 two-core pack licenses (16 core licenses) or the actual number of physical cores in use. Customers with processor licenses with Software Assurance (SA) can upgrade to System Center 2016 at no additional cost. At end of the SA term, processor licenses will be exchanged for core licenses and customers can renew their SA on core licenses. 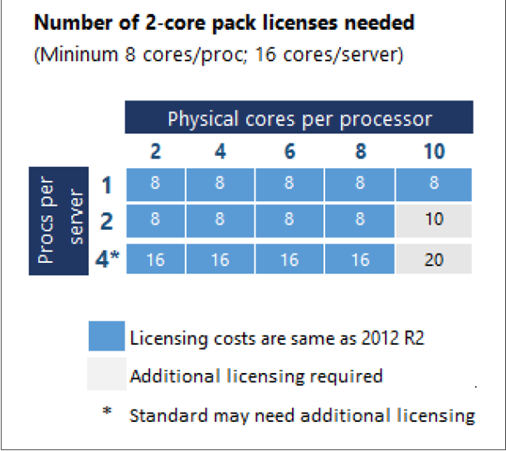 System Center 2-proc licenses with SA will be exchanged for a minimum of 8 two-core pack licenses (16 core licenses) or the actual number of physical cores in use on the server under management.